Peanut Butter (and life lessons on failure) | Naturally. From a young age we are taught that life will be full of trial and errors. Sometimes those trials will lead to success while others will lead to failure. Failure is not something to be ashamed of but the emphasis is rather put on how we handle those failures. Do we try again or do we give up. In education we are suppose to watch out for self-efficacy in students. If a person fails enough times to feel like they can’t do it, they give up. I couldn’t understand how something that should be so easy was causing me so much grief. All I needed to do was whiz some peanuts in a food processor until it magically turned into peanut butter. And yet, I continued to fail. I end up with this strange peanut paste that while tasted good, would smear on toast and just seemed to crumble. I never could get something creamy and delicious. I invested in a good food processor (not a $30 one you get a walmart) and then I went on the hunt for peanuts. I found these non-roasted, unsalted peanuts in the bulk bin and I knew that I’d need to roast them. (next time, I’ll be looking for dry-roasted, unsalted peanuts.) There’s also different kinds of peanuts that have higher oil contents than others. These peanuts ( like Spanish and Valencia Peanuts) make for better peanut butter. So, I corrected the outside influences, turned on my food processor, and crossed my fingers. Failure wasn’t an option this time. 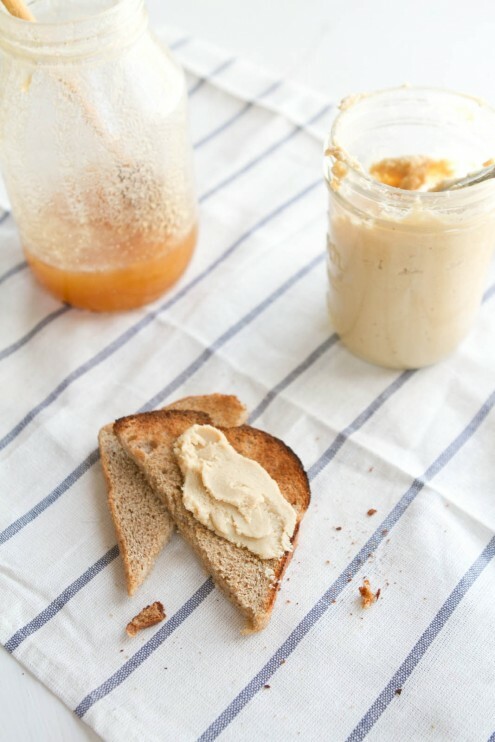 I watched the peanuts slowly turn from this hard object into this delicious creamy spread. I’d succeeded and now I have homemade peanut butter as a reward for not giving up. If using non-roasted peanuts, place peanuts on a baking tray covered in parchment paper. Roast at 275˚ for 45 minutes. Peanuts should have a nice roasted flavor to them. If using roasted peanuts, skip this step. 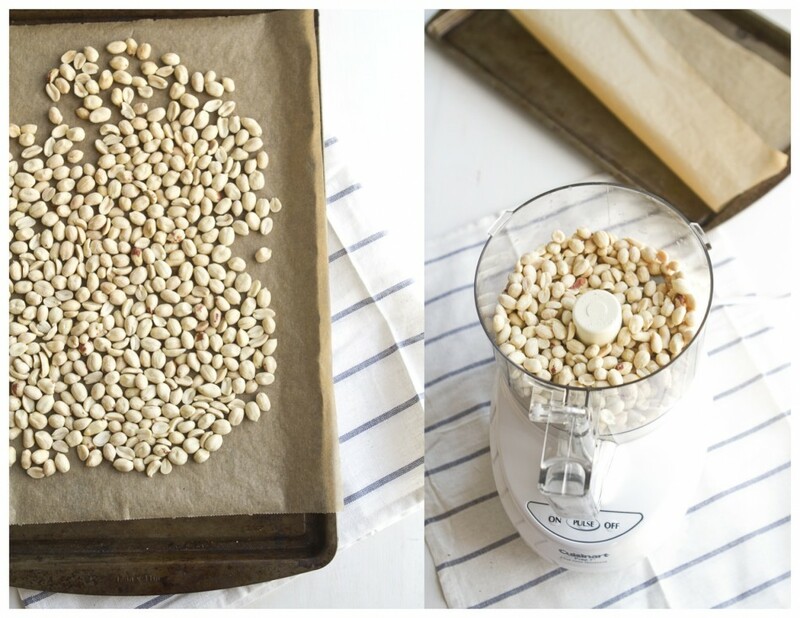 Place peanuts in a food processor and turn on. 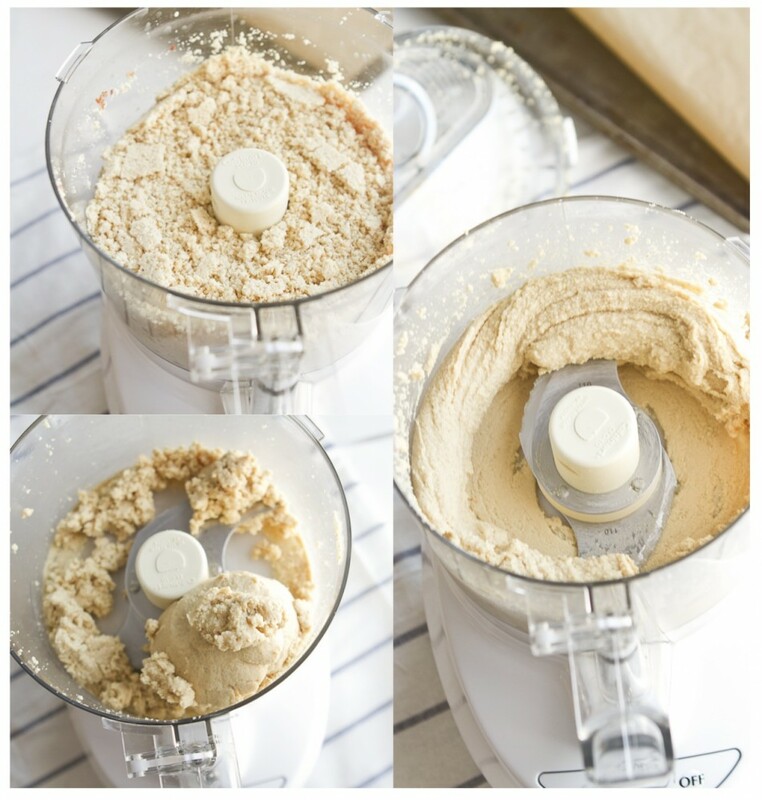 Peanuts will go through different stages but you will want to let your food processor run until the oil has released from peanuts. 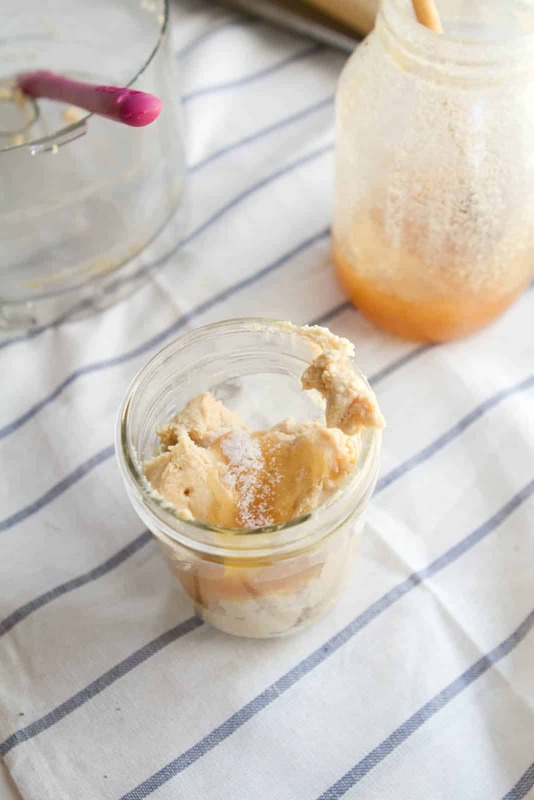 Turn off food processor and transfer to a mason jar. Stir in a pinch of salt and desired sweetener. Cover with an air tight lid and keep in the refrigerator. 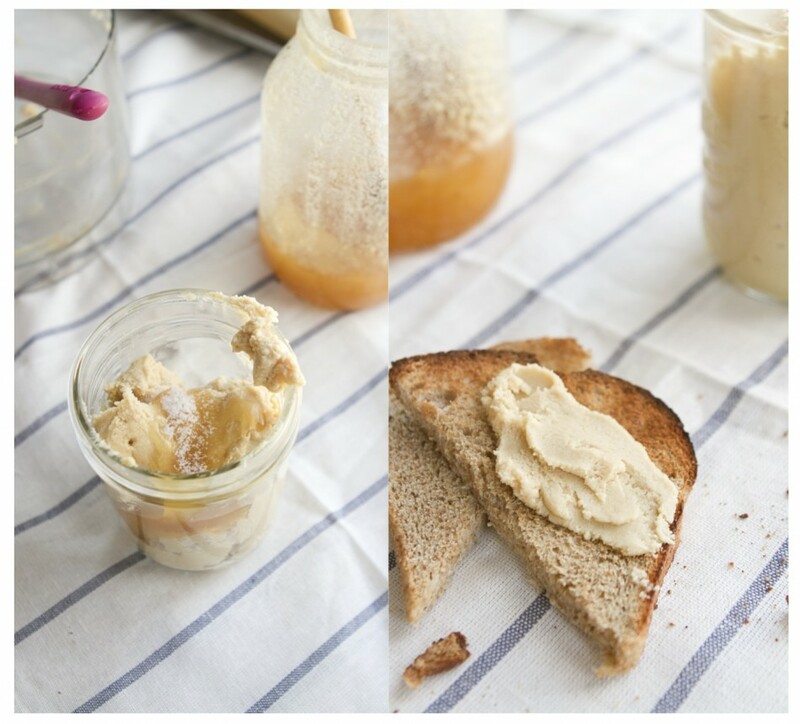 Home-made peanut butter is sooo much better than those ones from supermarkets! If you look and see what kind you use- let me know! How cool. I’ve always wanted to make my own nut butters, particularly peanut butter. Thank you for sharing your failings – boy have I been there before – so we can learn from them too! Such a simple and delicious recipe! Now I know exactly what to do with my jar of unsalted peanuts. Perfect! I am in the market for a food processor and there are SO many choices/ options! Which one did you decide on? Thanks!!! Thanks, Ella! I think I have the same immersion blender as you and it is fantastic! Cannot wait to put this food processor to work in my kitchen! Have a great weekend! I don’t take failure very well myself, but time and time again, it’s been proven to me that if you try again, you’ll often succeed. Marla linked both of our peanut butter’s up in her last post. I use honey roasted peanuts from TJs and they work like a charm! Or course so do unsalted, unroasted, etc but if you want to save yourself a step, and no need to bother adding more honey, the TJs nuts are great! Not that you need any advice – your PB looks perfect! Thank you so much for this post! I, too, have had a few failures with peanut butter lately and couldn’t figure out why. Just this morning I made a new batch of peanut butter and let the food processor run much longer than I had in the past and VOILA, creamy peanut butter. I’m so happy about this, so thank you for sharing your wisdom. I LOVE this post. I tried to make homemade peanut butter tonight and it was an epic fail! I too felt like a failure and was searching online for others that had the same issue. I definitely bought a cheap processor and didn’t realize I needed roasted peanuts – so there ya go, mystery solved. Most importantly I love your message about never giving up and how we handle our failures. Thank you for sharing this!